The Banff Springs Hotel sits nestled among pine trees on the bank of the Bow River. Named for the nearby Mineral Springs, this grand castle was opened for business in 1888 by the Canadian Pacific Railway. Billed as The Finest Hotel in North America, it attracted visitors from around the world. Expanded facilities enhance the stay of modern day guests. 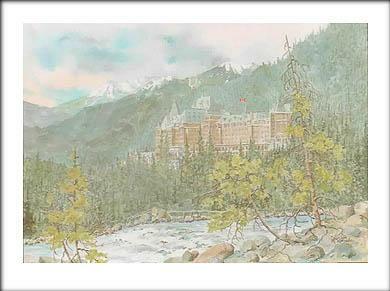 This scene of the hotel, Sulphur Mountain and Bow Falls was painted by Canmore Artist Marilyn Kinsella. Noted for her watercolour images of the Canadian Rockies, Marilyn uses a variety of perspectives to interpret this scene.